Published in L. Frank Baum's first children's book, Mother Goose in Prose (1897), illustrated by Maxfield Parrish. You might also enjoy the Mother Goose collection of nursery rhymes, including Little Miss Muffet. Little Miss Muffet's father was a big banker in a big city, and he had so much money that the house he lived in was almost as beautiful as a king's palace. It was built of granite and marble, and richly furnished with every luxury that money can buy. There was an army of servants about the house, and many of them had no other duties than to wait upon Miss Muffet, for the little girl was an only child and therefore a personage of great importance. She had a maid to dress her hair and a maid to bathe her, a maid to serve her at a table and a maid to tie her shoe-strings, and several maids beside And then there was Nurse Holloweg to look after all the maids and see they did their tasks properly. The child's father spent his days at his office and his evenings at his club; her mother was a leader in society, and therefore fully engaged from morning till night and from night till morn; so that Little Miss Muffet seldom saw her parents and scarce knew them when she did see them. I have never known by what name she was christened. Perhaps she did not know herself, for everyone had called her "Miss Muffet" since she could remember. The servants spoke of her respectfully as Miss Muffet. 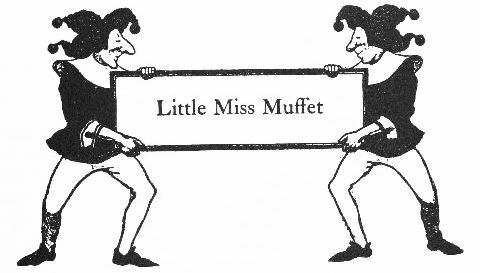 Mrs. Muffet would say, at times, "By the way, Nurse, how is Miss Muffet getting along?" And Mr. Muffet, when he met his little daughter by chance on the walk or in the hallway, would stop and look at her gravely and say, "So this is Miss Muffet. Well, how are you feeling, little one?" And then, without heeding her answer, he would walk away. Perhaps you think that Miss Muffet, surrounded by every luxury and with a dozen servants to wait upon her, was happy and contented; but such was not the case. She wanted to run and romp, but they told her it was unladylike; she wished to play with other children, but none were rich enough to be proper associates for her; she longed to dig in the dirt in the garden, but Nurse Holloweg was shocked at the very thought. So Miss Muffet became sullen and irritable, and scolded everyone about her, and lived a very unhappy life. And her food was too rich and gave her dyspepsia, so that she grew thin and pale and did not sleep well at night. One afternoon her mother, who happened to be at home for an hour, suddenly thought of her little daughter; so she rang the bell and asked for Nurse Holloweg. "How is Miss Muffet, Nurse?" enquired the lady. "Very badly, ma'am," was the reply. "Badly! What do you mean? Is she ill?" "She 's far from well, ma'am," answered the Nurse, "and seems to be getting worse every day." "Well," replied the lady; "you must have the doctor to see her; and do n't forget to let me know what he says. That is all, Nurse." "She must have a change. Take her away into the country as soon as possible." "And very good advice it was, too," remarked the Nurse to one of the maids; "for I feel as if I needed a change myself." "Very well; I will see Mr. Muffet and have him write out a cheque." And so it was that a week later Little Miss Muffet went to the country, or rather to a small town where there was a summer hotel that had been highly recommended to Nurse Holloweg; and with her went the string of maids and a wagon-load of boxes and trunks. The morning after their arrival the little girl asked to go out upon the lawn. "Well," replied Nurse Holloweg, "Sarah can take you out for half an hour. But remember you are not to run and get heated, for that will ruin your complexion; and you must not speak to any of the common children you meet, for your mother would object; and you must not get your shoes dusty nor your dress soiled, nor disobey Sarah in any way." Little Miss Muffet went out in a very angry and sulky mood. "What 's the use of being in the country," she thought, "if I must act just as I did in the city? I hate Nurse Holloweg, and Sarah, and all the rest of them! and if I dared I 'd just--just run away." Indeed, a few minutes later, when Sarah had fallen asleep upon a bench under a big shade tree, Miss Muffet decided she would really run away for once in her life, and see how it seemed. There was a pretty lane near by, running between shady trees far out into the country, and, stealing softly away from Sarah's side, the little girl ran as fast as she could go, and never stopped until she was all out of breath. While she rested and wondered what she could do next, a farmer came along, driving an empty cart. "I 'll catch on behind," said Miss Muffet, gleefully, "just as I 've seen the boys do in the city. Won't it be fun!" So she ran and caught on the end of the cart, and actually climbed into it, falling all in a heap upon the straw that lay upon the bottom. But it did n't hurt her at all, and the next minute the farmer whipped up his horses, and they went trotting along the lane, carrying Miss Muffet farther and farther away from hated Nurse Holloweg and the dreadful maids. She looked around upon the green fields and the waving grain, and drew in deep breaths of the fresh country air, and was happy for almost the first time in her little life. By and by she lay back upon the straw and fell asleep; and the farmer, who did not know she was in his cart, drove on for many miles, until at last he stopped at a small wooden farmhouse, and jumped to the ground. A woman came to the door to greet him, and he said to her. "Well, mother, we 're home again, you see." "So I see," she answered; "but did you bring my groceries?" "Yes," he replied, as he began to unharness the horses; "they are in the cart." So she came to the cart and looked within, and saw Miss Muffet, who was still asleep. "Where did you get the little girl?" asked the farmer's wife, in surprise. "What little girl?" asked he. "The one in the cart." He came to the cart and looked in, and was as surprised as his wife. "She must have climbed into the cart when I left the town," he said; "but waken her, wife, and we will hear what she has to say." So the farmer's wife shook the girl by the arm, and Miss Muffet sat up in the cart and rubbed her eyes and wondered where she was. "How came you in my cart?" asked the farmer. "I caught on behind, and climbed in," answered the girl. "What is your name, and where do you live?" enquired the farmer's wife. "My name is Miss Muffet, and I live in a big city,--but where, I do not know." "We must keep her till some one comes to claim her, and she can earn her living by helping me make the cheeses." "That will be nice," said Miss Muffet, with a laugh, "for Nurse Holloweg never lets me do anything, and I should like to help somebody do something." So they led her into the house, where the farmer's wife wondered at the fine texture of her dress and admired the golden chain that hung around her neck. "Some one will surely come for her," the woman said to her husband, "for she is richly dressed and must belong to a family of some importance." Nevertheless, when they had eaten dinner, for which Little Miss Muffet had a wonderful appetite, the woman took her into the dairy and told her how she could assist her in curdling the milk and preparing it for the cheese-press. "Why, it 's really fun to work," said the girl, at first, "and I should like to live here always. I do hope Nurse Holloweg will not find me." After a time, however, she grew weary, and wanted to rest; but the woman had not yet finished her cheese-making, so she bade the girl keep at her tasks. "It 's time enough to rest when the work is done," she said, "and if you stay with me you must earn your board. No one is allowed to idle in this house." So Little Miss Muffet, though she felt like crying and was very tired, kept at her work until at length all was finished and the last cheese was in the press. "Now," said the farmer's wife, "since you have worked so well I shall give you a dish of curds and whey for your supper, and you may go out into the orchard and eat it under the shade of the trees." Little Miss Muffet had never eaten curds and whey before, and did not know how they tasted; but she was very hungry, so she took the dish and went into the orchard. She first looked around for a place to sit down, and finally discovered a little grassy mound, which is called a tuffet in the country, and seated herself upon it. Then she tasted the curds and whey and found them very good. But while she was eating she chanced to look down at her feet, and there was a great black spider coming straight towards her. The girl had never seen such an enormous and hideous-looking spider before, and she was so frightened that she gave a scream and tipped backward off the tuffet, spilling the curds and whey all over her dress as she did so. This frightened her more than ever, and as soon as she could get upon her feet she scampered away to the farmhouse as fast as she could go, crying bitterly as she ran. The farmer's wife tried to comfort her, and Miss Muffet, between her sobs, said she had seen "the awfulest, biggest, blackest spider in all the world!" This made the woman laugh, for she was not afraid of spiders. Soon after they heard a sound of wheels upon the road and a handsome carriage came dashing up to the gate. "Has anyone seen a little girl who has run away?" asked Nurse Holloweg, leaning out of the carriage. "Oh, yes" answered Little Miss Muffet; "here I am, Nurse. And she ran out and jumped into the carriage, for she was very glad to get back again to those who would care for her and not ask her to work making cheeses." "You must promise me, Miss Muffet, never to run away again. You have frightened me nearly into hysterics, and had you been lost your mother would have been quite disappointed." "I will promise not to run away if you will let me play as other children do. But if you do not allow me to run and romp and dig in the ground, I shall keep running away, no matter how many horrid spiders come to frighten me!" And Nurse Holloweg, who had really been much alarmed at so nearly losing her precious charge, thought it wise to agree to Miss Muffet's terms. She kept her word, too, and when Little Miss Muffet went back to her home in the city her cheeks were as red as roses and her eyes sparkled with health. And she grew, in time, to be a beautiful young lady, and as healthy and robust as she was beautiful. Seeing which, the doctor put an extra large fee in his bill for advising that the little girl be taken to the country; and Mr. Muffet paid it without a word of protest. Even after Miss Muffet grew up and was married she never forgot the day that she ran away, nor the curds and whey she ate for her supper, nor the great spider that frightened her away from the tuffet. Add Little Miss Muffet to your own personal library.